Hungarian physicist; born in Gönez-Ruszka, Abauj county, Feb. 16, 1823; died in Budapest May 21, 1866. He attended the University of Prague, devoting himself especially to mathematics and pedagogics. 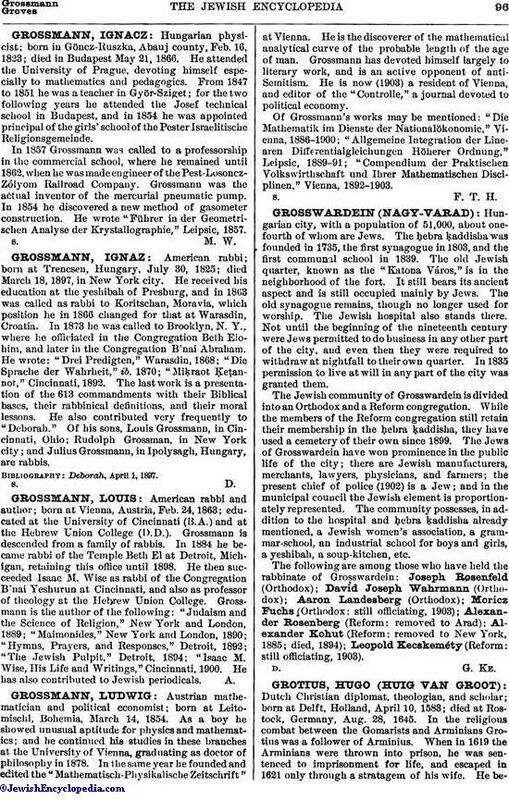 From 1847 to 1851 he was a teacher in Györ-Sziget; for the two following years he attended the Josef technical school in Budapest, and in 1854 he was appointed principal of the girls' school of the Pester Israelitische Religionsgemeinde. In 1857 Grossmann was called to a professorship in the commercial school, where he remained until 1862, when he was made engineer of the Pest-Losonez-Zólyom Railroad Company. Grossmann was the actual inventor of the mercurial pneumatic pump. In 1854 he discovered a new method of gasometer construction. He wrote "Führer in der Geometrischen Analyse der Krystallographie, "Leipsic, 1857.